Sure enough, it is almost Easter… and so a snowstorm has hit! 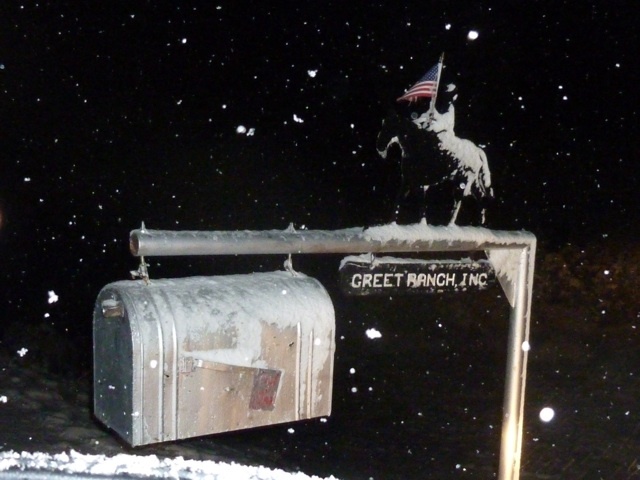 I went to Worland tonight to a Pet First Aid Class… and decided to take this photo of our mailbox as I drove in just half an hour ago. Though we only have 3 inches or so on the ground, it does look more impressive when I used my flash! Tonight, Daniel is the only one home for Easter… brother Brandon is feeling sick and will probably stay in Laramie and sleep… Victoria has plans with Matt. Nevertheless, I think the Easter bunny will still stop in… he has to be very quick to avoid my guardian English Shepherds! But really… another excuse to eat chocolate… can’t pass that up! The best thing about this weekend of rebirth and snowstorms… all this snow will quench the thirst of the green grass trying to appear… and soon this land will bloom.